This is a great article because it is written by Howard Marmon, chief engineer of Nordyke & Marmon, the company that produced the Marmon Wasp, the winning car of the first Indianapolis 500. Check out this interesting article on Theodore T.E. "Pop" Myers who served as a senior executive at the Indianapolis Motor Speedway longer (1910 to 1952) than other man in the track's history. 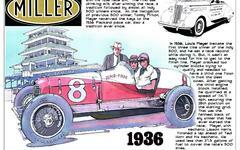 Fred Wagner was the recognized premier auto race starter of America in the sport's early days. Stoughton A. Fletcher was a scion of the ultra-rich Indiana banking family, the Fletchers or Fletcher National Bank. As the story goes Fletcher, the top executive at his family bank had planned to throw in with Carl Fisher and the other founders of the Indianapolis Motor Speedway when they purchased the land in 1908. The man Indianapolis Motor Speedway Founder Carl Fisher turned to when he wanted to master the skills of flying giant balloons was Captain George L. Bumbaugh. Among the most influential people in Indiana during the era of the Indianapolis Motor Speedway's construction was Thomas Taggart, a former mayor of Indianapolis and chairman of the Democratic National Committee. This brief article with an image was first published in the July 3, 1909 Indianapolis Star and reported on the development of a 12-cylinder engine by George Schebler, one of the two founders of the Wheeler-Schebler Carburetor Company.